We have made good progress on the electrical wiring despite the fact that I am totally lost when it comes to wiring a house. What started as wires going everywhere is slowly making sense to me now. That said, I am no electrician and I hope to never wire a house again in my life. Also installed now is our Heat Pump & Air conditioning system. Flippo HVAC out of Walnut Ridge did the install for us and we could not be happier with them and the system they installed. These guys rolled in with about 6 trucks and 12-15 people and knocked out the install in just over one day! 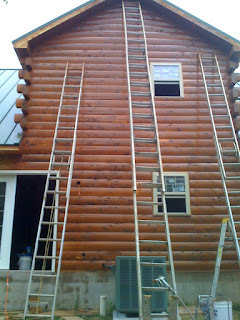 As for the rest of the house, we finally got all of the roof finished and got the sealant on all of the logs and siding. We still have to seal a little on the facia, but that will not take long. (Funny side note: the owner of NEA Metal supply, the company that took so long with our roofing metal, was arrested last week for hot checks and for failing to pay taxes. Karma???) One thing I have noticed is that my knees don't shake quite as bad when I'm on the 40 foot ladder or when I'm walking across the ceiling joists in the garage as they did when we started. I guess I'm getting used to the hights! We owe a huge debt to both of our fathers for all of their hard work over the last few weeks. With my work schedule, nothing would have been done without their help. And of course to Theron, for making sure that we measure up! 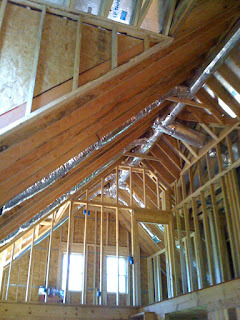 The last post about the house was when we got the roof completely on and decked. Since then we have gotten metal on the roof. It looks so good! We are very happy with it. We are extremely unhappy with the metal company though. I cannot stress how extremely unhappy we are with NEA Metal Supply of Paragould. DO NOT USE THEM!!!! It has been 3 months now since we ordered all of the materials for the roof and there are still parts that we do not have. We are still waiting on the ridge cap for the roof. We got excuse after excuse on why they didn't have our stuff. I ended up having to call and be very ugly to the man at the company before we got anything accomplished. This was a month and a half after we ordered the materials. I have all of the interior walls stained and they look great! We also got our mantle which is really pretty. I got the whole front of the porch stained and it looks really good too! The plumbers finished up today so we having pipes running every where now. The heat and air people are working on getting out to us too!!! We've got to clean out the camper! Justin hasn't slept in his own bed since Monday night! He left early Monday morning for a TX trip. (Check his blog for the latest post about that.) I was really uneasy about him going on this trip since I knew the weather was going to be bad between here and there. I am normally not uneasy about him going on trips over night (actually to tell the truth we both look forward to him going on an overnight trip once in a while! ), but for some reason I wasn't looking forward to him going. Probably because I knew it could be several days before he could get back home. He did get to come home on Wednesday (thank goodness). We were out of school on Tuesday as a precaution. About 7 that night I headed to my parents house. I knew that if the power went out at Ron & Jill's all they have is the wood fireplace and I didn't want to impose on them any more than we already are. My parents have gas heat and tend to be very overly prepared for power outages. They live out in the country and the power goes out pretty often out there. I spent the next four nights at their house. Justin came out and stayed there too once he got home. On Thursday we went all over town and to Trumann looking for lamp oil and D batteries. We like everyone else in the area were in need of those things and of course couldn't find them anywhere. We did however find the cutest welcome bear for the house and a coleman camp stove to replace the one of my dad's that wasn't working so well. It was the last stove in the store. We got there just ahead of another man and I think he was a little irrtated that we took it and didn't let him have it. We finally found the lamp oil and batteries in Memphis!!! 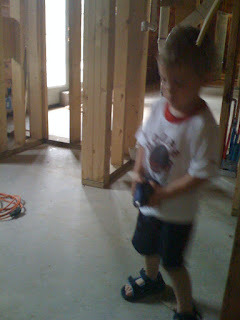 We had to run over and look at some flooring so the hunt continued on there. The Wal-Mart in Germantown had coleman kerosene (lamp oil) for the lamps and we found batteries at the Bass Pro there. The Bass Pro was completely wiped out of every camping supply they had! Saturday we spent the night at our friend's Keith & Denise's house. And we are now staying with Joslyn and Aaron. We feel like gypsies! We have been living out of the jeep and a suitcase for days now. Justin looked at me Saturday night and said, "Courtney, we have got to clean out this camper!" The jeep doesn't make the best camper, but we are making the best of what we've got til the power is back on at Ron & Jill's. A huge thanks to those that have taken us in this last week. We really do appreciate it! As you can see they really do live out in the country with ALOT of trees! The have one lone tree that didn't loose any branches. Their place is going to take all year to clean up. Some of it will probably never get cleaned up. They still don't have power either. Well, I guess that is the best and the worst of Winter Blast 2009 for us! Since the last post a lot of progress has been made. 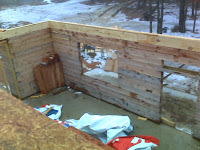 With the rafters finished the dormers were built. As you can see this made Courtney pretty happy. With those done and some decking on the roof, you can really see what the house will look like now. In the last post, I mentioned that the master bedroom was a little smaller than I like. Well, that was when the dormer wall extended into the room a bit farther than it actually had to. We were able to change that and it added quite a bit of usable space to the room. 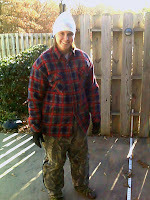 In this picture, I laid a piece of wood down so that you can see where the wall was vs. where it is now. Its not a huge amount of space, but it was amazing how much that opened up the room. I just had to get up and see how steep the roof really is. It is REALLY steep. I guess he is not scared of heights! It is looking more and more like a house these days. 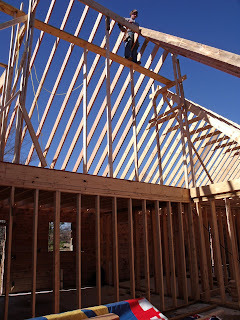 The framers we hired (best investment so far) have really been moving quickly. It is really nice to see the house with rafters on it because now we can really get a feel for how it is going to look. So far we are pretty happy with how things are turning out with one exeption, our bedroom. It is not bad, but it got a little smaller than we would have liked. Thats not too big of a problem for us though because we really don't figure we will need that much space in there. There is luckily a lot of room everywhere else! 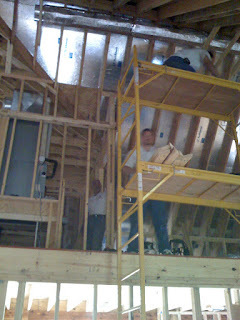 You can see the rafters going on the front over the loft area in this pic. Lifting that rafter into position with no floor under it makes this a pretty difficult task. I don't think the guys were too happy about doing this. One more shot of the back. I'm sure I will get in trouble for that one. After finishing the interior walls for the first floor we had to remove the tonges that are on the top of the logs so that we could set the floor for the second. 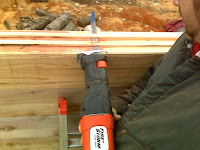 (When I said we could set I mean we could have the framers that we hired set) We tried several methods to take them off but the best I found was to use a reciprocating saw. After a lot of up and down on the ladder and that is finally done. Once we were finished we were ready for the framers. I am very impressed so far with our framers. They actually started Tuesday. They were knocking ice off of lumber so that they could use it. Those were miserable conditions and these three guys were working at a pace I could only dream of. 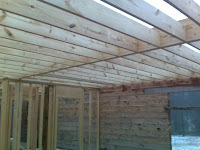 They finished out the top plates on the 1st floor walls and then got right to setting the floor joists. With all of the floor joists set they built a temporary stair case and then started laying the floor material. It was pretty cool to stand in our loft and look over into the living room! Top floor walls and roof coming soon!